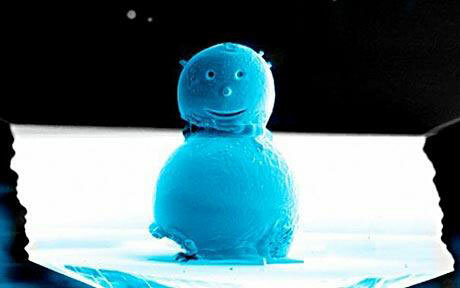 The snowman is 10 µm across, 1/5th the width of a human hair. The snowman was made from two tin beads used to calibrate electron microscope astigmatism. The eyes and smile were milled using a focused ion beam, and the nose, which is under 1 µm wide, is ion beam deposited platinum. A nanomanipulation system was used to assemble the parts 'by hand' and platinum deposition was used to weld all elements together. The snowman is mounted on a silicon cantilever from an atomic force microscope whose sharp tip 'feels' surfaces creating topographic surveys at almost atomic scales. – To make and fine tune Atomic Force Microscope cantilevers for measuring surface topography. – To manufacture nano scale SQUIDs (Superconducting Quantum Interference Devices) for a wide range of future metrological applications including spintronics, single particle detection, NEMS and quantum information processing.